There’s something about the water that restores man’s soul. Perhaps it’s because, as scientists claim, the human body is comprised of 65% water, (78% for infants) so when we stand by the water’s edge we have a feeling of coming home. Poets for centuries have tried to capture the sense of awe and wonder, grandeur and majesty, serenity and release we experience when on the water. Not long ago, I joined a friend for Dragon Boat racing. Twenty four of us in a long lean boat were rowing like mad, drenched in freezing salt spray, and grinning like idiots, just joyful to be one with the sea. Add wind to the equation and you awaken a different animal – the intrepid sailor. The mariner tackles nature full on. With total respect for her might and power, he enters the dance. 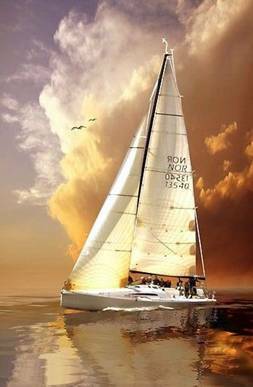 “That’s what sailing is, a dance, and your partner is the sea. And with the sea you never take liberties. You ask her, you don’t tell her. You have to remember always that she’s the leader, not you. You and your boat are dancing to her tune. For some, sailing is in their blood, for others, they acquiesce through happenstance – summer camp, geographical move, etc. Regardless, once sailing has laid claim to your heart, it rarely, if ever lets go. 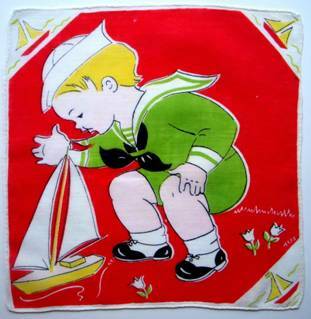 We’ll start our hankie sojourn with young mariners. A toddler in full sailor garb practices skippering his ship. 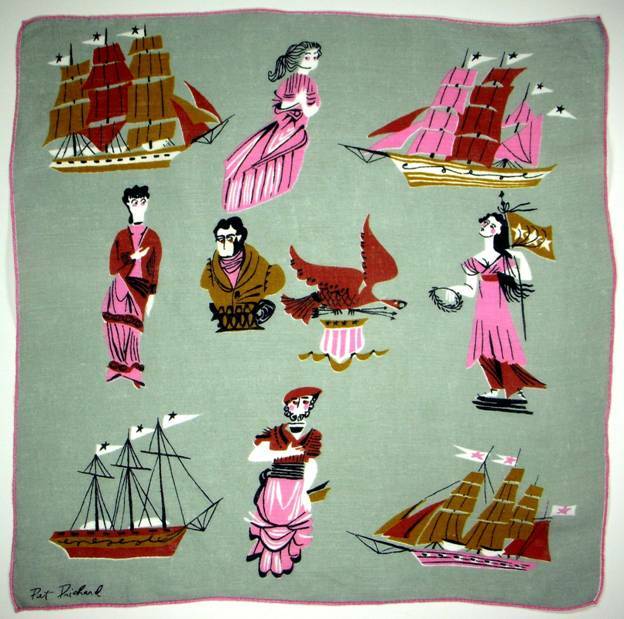 Crisp clean nautical graphics delineate this fanciful fleet. 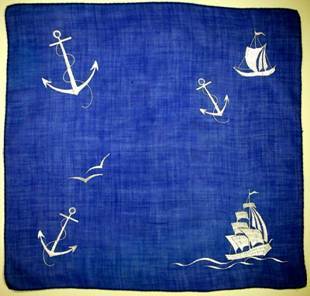 Sailors swab the decks, swing semaphore signals, weigh anchor, play pirate, and skip to shore leave on this smart and snappy child’s handkerchief. 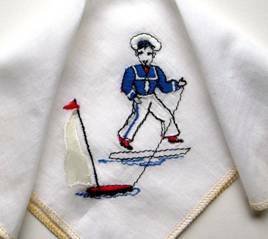 Lovely hand embroidery adorns a trio of “Sunday best” children’s dress handkerchiefs. Look closely. 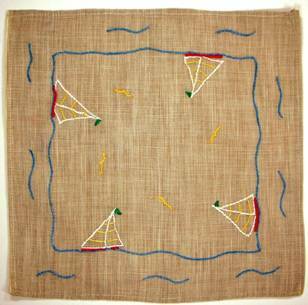 This young sailor’s skiff sports an organdy sail which flutters freely. These blue bordered gems would inspire any wistful wanderer to take to the seas. Who could have guessed these little dolls would grow up to be…. 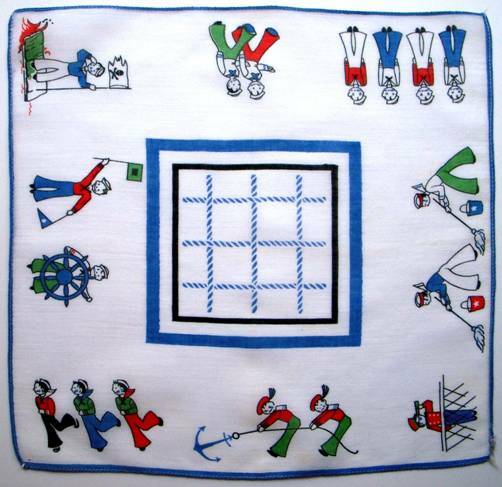 When told the America’s Cup team would be at Pier 28 one day, I grabbed a hankie reminiscent of a semaphore flag, hoping to garner a few autographs. Silly me. I should have known the team would never kick back en masse on a work day. Two teammates were available; the rest were hard at work on the bay, endlessly honing their skills. Below, a signalman swings missives from his aerie perch, while an Admiral-at-attention attempts to command a rowdy crew returning from shore leave. 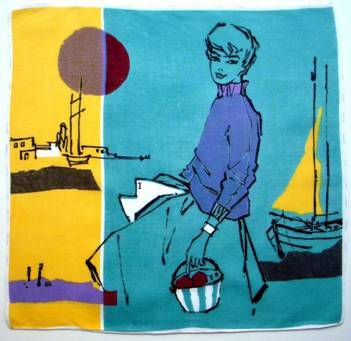 Everything about this hankie is engaging and refreshing, from the sophisticated graphics to the cheerful color palette. Take me with you! Another view of men at sea swirls in a tangled gaggle of fishermen in tiny boats. 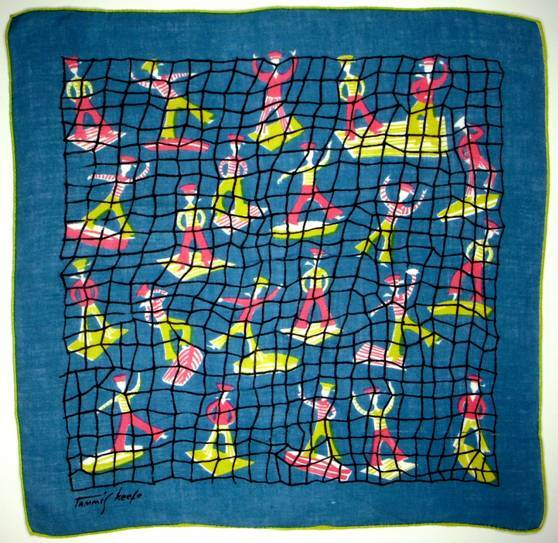 Artist Tammis Keefe throws a bold net over the entire fanciful fleet. The juxtaposition of lime green and pink against deep aquamarine is as bracing as a whoooosh of cold salt spray. Fun! 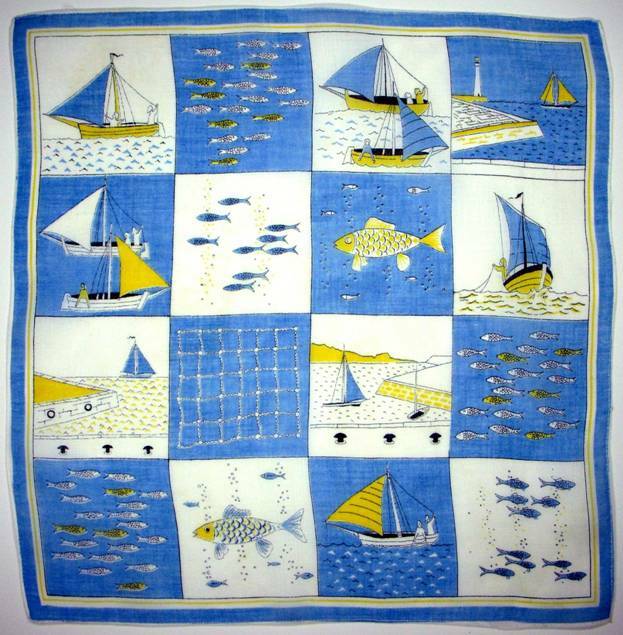 A crisp grid of ice blue and slicker yellow create a chess match of fisherman vs. catch. It’s vibrant and fresh, while remaining friendly and fun. Taken singularly, each scene assumes quite a different feel – of solitude and isolation, even loneliness. The vastness of the horizon when viewed from a boat stirs a sense of expansiveness, while simultaneously reminding us of how infinitesimal and vulnerable we are. Like many endeavors, sailing has its own vocabulary. Sea Dogs delight in throwing a bit of flotsam and jetsam in the path of the landlubbers, so if you promise not to skip ahead, I promise to define some oft used terms at the end of this blog. In the meantime, I’ll throw a question or a term your way to tease the gray matter. Let’s begin: What gemstone did superstitious sailors of yore carry to ensure safe passage at sea? The impatient rarely fare well at sea, for Mother Nature controls the tides, the winds, the storms, the sunsets – every aspect of your journey. Languid days and star studded nights allow ample time for reflection, contemplation and perhaps your artistic side to emerge. 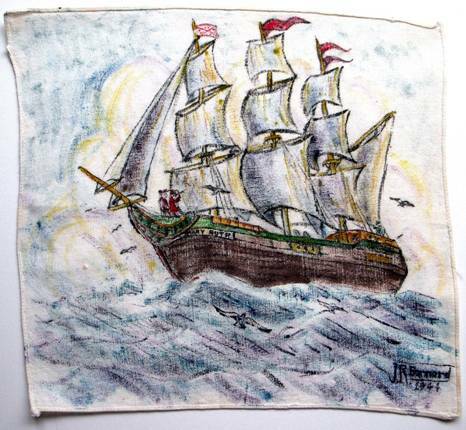 In this 1944 folk art piece, an inspired sailor uses his handkerchief to sketch the Mary Ruth. 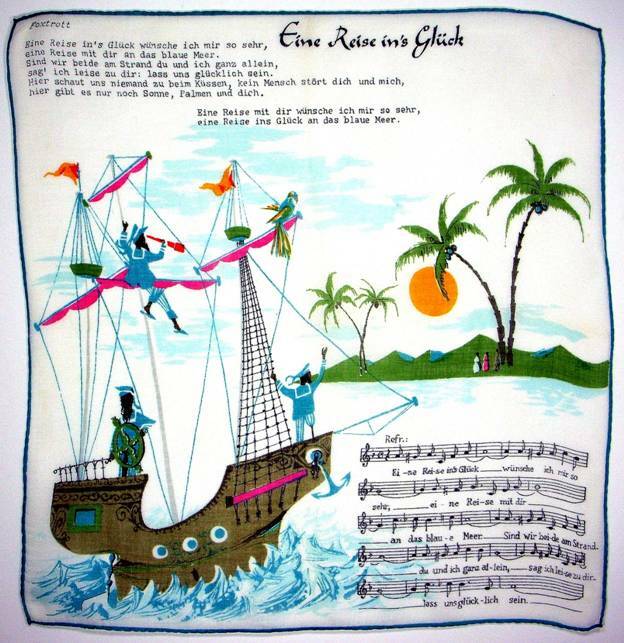 A feeling of romance for the sea often inspires romance on the sea, shown here in this handkerchief titled “Eine Reise in Gluck” or A Journey to Happiness. 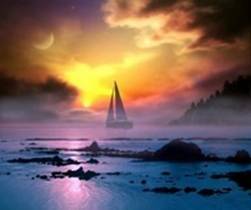 The song lyrics loosely translate – I want so much to take a journey with you to the blue sea. We are at the beach. You and I alone. 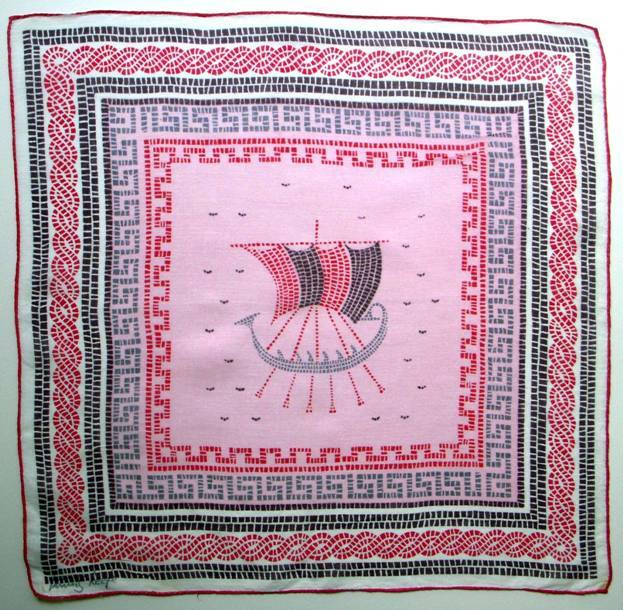 I say softly to you “Let’s get happy.” Well alrighty… A galleon with hot pink sails? Methinks these sailors are up for any adventure on land or sea. 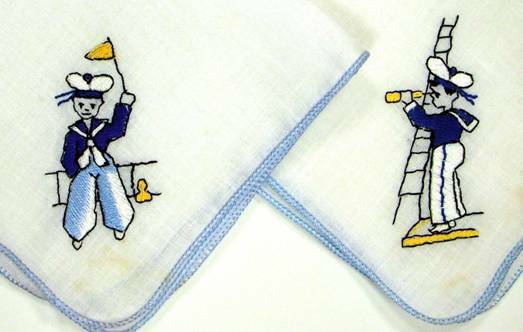 We can join them in spirit by popping this hankie in our pocket. One nautical element teeming with romantic imagery is a ship’s figurehead. The Vikings (800 BC) ornamented their bows with menacing figures to ward off evil spirits. Egyptians had images of birds on the prow, while Phoenicians used horses to represent speed. Greeks used boars’ heads to symbolize acute vision and ferocity while Romans mounted centurions to represent valor. 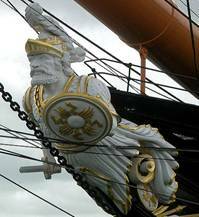 Great trading nations – France, Holland, Spain, France, Portugal, and city-states such as Genoa and Venice all had figureheads adorning both merchant ships and warships. 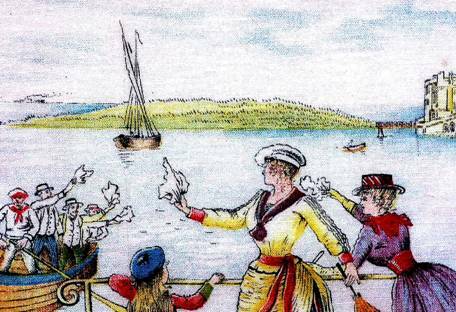 As soon as the weather allowed, sailors would cast off again, as witnessed in this sweet Victorian scene. Below is the full picture. What does a sailor gather in his travels? 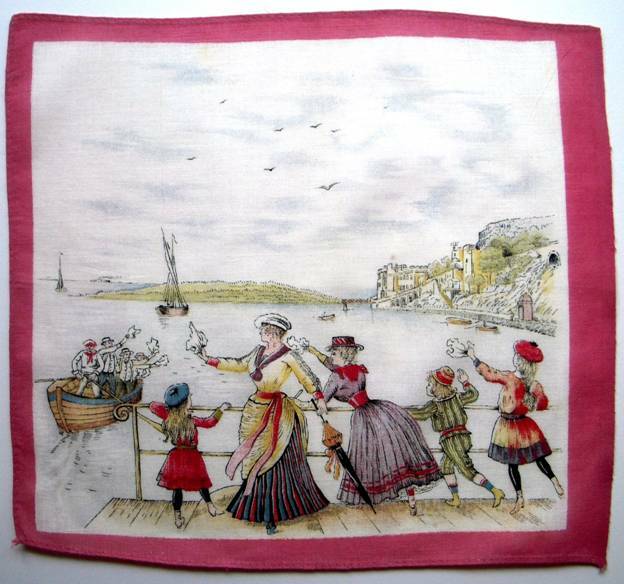 Perhaps a pair of fine linen embroidered hankies from Paris for his lady fair. I love the gentle seafoam green in contrast to the sunny yellow. And don’t we all need soft days and sunny days? So many ports of call, so many splendid towns. 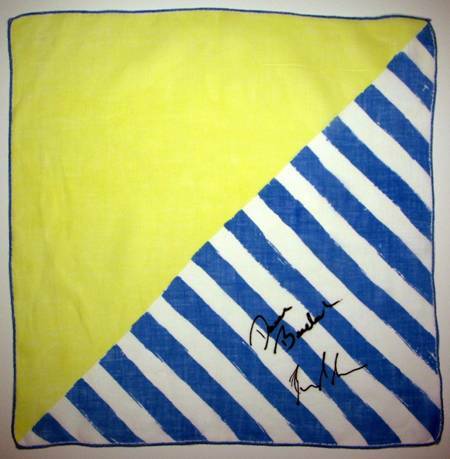 Whether Paris or Philadelphia, this hankie records man’s explorations. Indeed, without the Nile, The Volga, The Danube, The Seine, The Mississippi, and more, man’s curiosity would have been curtailed, his explorations crippled. 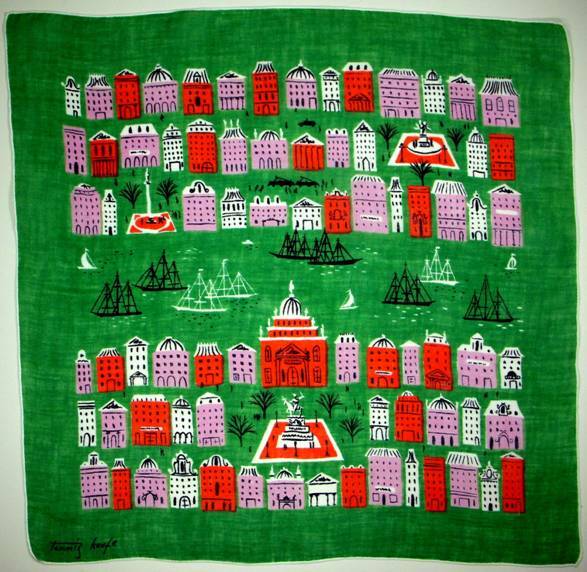 Water provided the arteries to support great cities and civilizations, as shown in this vibrant hankie. Sand, sea, and seagulls. Perfection. Brilliant blue and bobbing boats. Sublime. This “gal” could have sauntered off a 1960’s ad – fresh, bright, and perky. With a minimum of pen strokes and splashes of color, the artist captures the breeze catching her skirt, and the warmth of the sun drenched sky. Note the call back of the burgundy sun in her basket of apples. Terrific. The happy yellow sail luffs at the pier, in anticipation of a joyful journey. 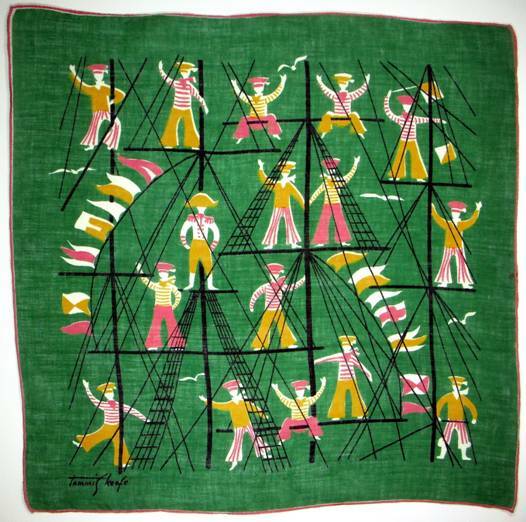 Handkerchiefs provided a canvas for the artist to tell his story, and we lost more than a utilitarian object with their demise. We lost pocket art that could make us smile, and recall special moments and memories. So we come full circle to the ships of ancient civilization – This could be a Greek Bireme from the Trojan War or possibly a Roman galleon. The mosaic border of Greek keys and twisted rope anchor the perimeter, while the mariners traverse an endless interior ocean. Their delicate vessel appears strong, yet vulnerable as they journey along. Once man discovered new lands and claimed them for his own, he had to defend them from interlopers. 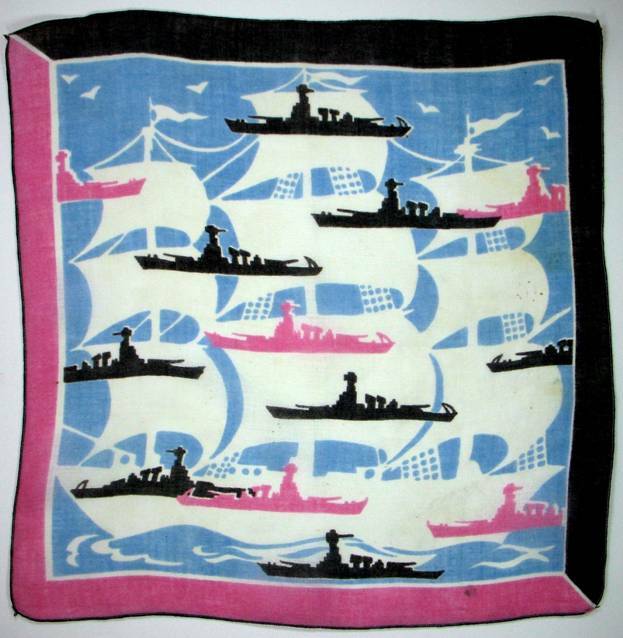 This handkerchief showcases a fleet of battleships at the ready. Note the subtext as the ghost of a frigate anchors the backdrop. It’s a powerfully layered image of sea battles through the centuries. The use of pastels paired with black serves to magnify the age old dichotomy of fighting for what you love. Whether at war or at peace, man will always take to the sea to answer the call to adventure, to experience unbridled freedom, to test his mettle against mother nature, and to simply feel at one with wind and water. 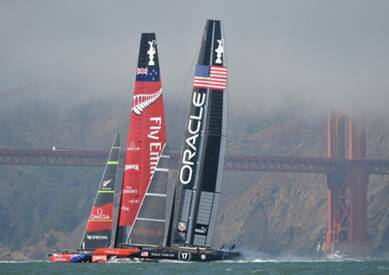 In a thrilling match between two worthy opponents, USA managed to roar from behind to win eight races in a row and recapture the America’s Cup. 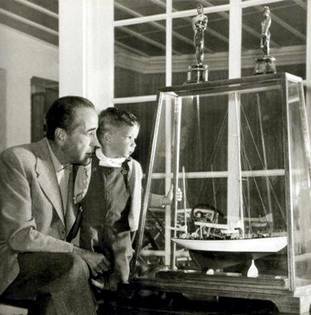 Humphrey Bogart with his son Steve, his Oscars and a model of his beloved Santana. 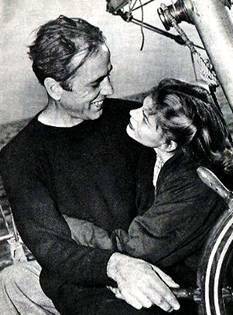 With one hand on the girl, and one hand on the wheel, Bogie handled both with consummate skill and love. Fathom – a nautical measurement equaling six feet. This length approximates the total length of a man’s outstretched arms. The verb “fathom” comes from Old English meaning to embrace, surround or envelop.” In today’s terminology, when you can’t fathom something, you can’t embrace or wrap your mind around the concept. Flotsam – the wreckage of a ship found floating on the water. Often used in conjunction with Jetsam, which refers to the goods deliberately thrown overboard, which later sink or wash ashore. (Our term to “jettison” or throw away something derived from the term jetsam.) Today flotsam and jetsam refer to useless odds and ends floating about. 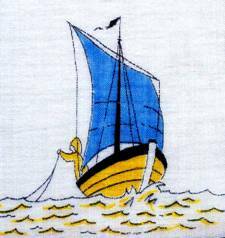 Landlubber – an unseasoned sailor. The opposite of a Sea Dog, a term used to describe an old or experienced sailor. 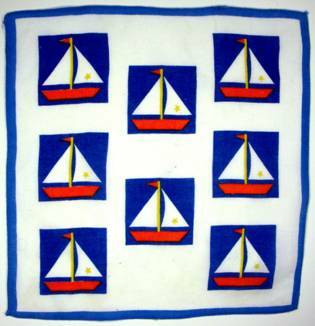 Moonraker – a light square sail set above the skysail at the top of the mast on a square-rigged ship in light winds. If the sail is triangular, it’s called a Skyscraper. Trivia: Moonraker is also a term applied to people from Wiltshire, England. Legend has it that a group of men from Wiltshire were discovered trying to rake the moon’s reflection out of a pond. Wiltshire natives claim they were raking the pond for kegs of bootleg brandy. When the constable appeared, the rakers feigned madness. Scuttlebutt – Ever gather around the water cooler to hear a bit of gossip? Apparently sailors did likewise, gathering around an open cask of drinking water or a drinking fountain, known in those days as a scuttlebutt. Shanghai – to enroll or obtain a sailor for the crew of a ship by unscrupulous means, for example, rendering him unconscious through the use of liquor or drugs. The incapacitated sailor is carried aboard and awakens once the ship is out to sea. What gemstone did superstitious sailors of yore carry to ensure safe passage at sea? Anything that undergoes a profound transformation has experienced a sea change. We hope perhaps this blog has inspired a sea change in our readers in terms of a new love for sailing. This quote is incorrectly attributed to Mark Twain, but is sage advice nonetheless.